External HDDs mainly work as portable backup storage device that can be attached to a computer through a USB connection. However, they do not move their deleted files into any Recycle Bin. This means Recycle Bin only stores the files deleted from internal hard drive, not from the external one. In this case, just keep off the hard drive and try RePicvid, a free photo recovery tool, to restore deleted photos and videos from internal/external hard drive. 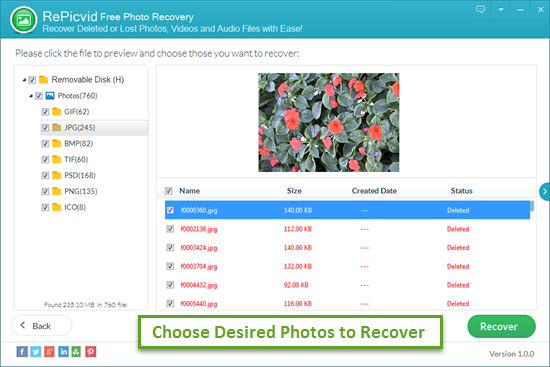 If you didn’t find the deleted photos in Recycle Bin, RePicvid Free Photo Recovery is the best solution you can try. 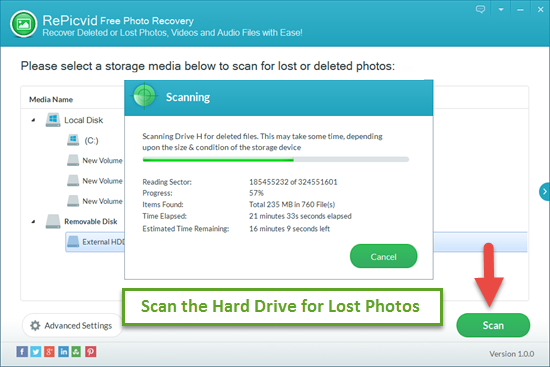 This freeware allows you to recover lost photos/videos/musics from Internal/External HHD or SSD due to accidental deletion, disk formatting, virus infection, etc. Note: To avoid photos being overwritten, you should stop using the hard drive disk by storing or creating new files. Besides, please close the other running programs on computer in case they produce new data on the HDD. Install and open RePicvid Photo Recovery Freeware. Click on the first option and connect your external hard drive to the computer. Select the external HDD(or Internal disk) where you lost pictures. Click the “Scan” button to get start. Before that, you can also to refine image types in “Advanced Settings” for faster scanning. You can preview the recovered images befoe recovery. 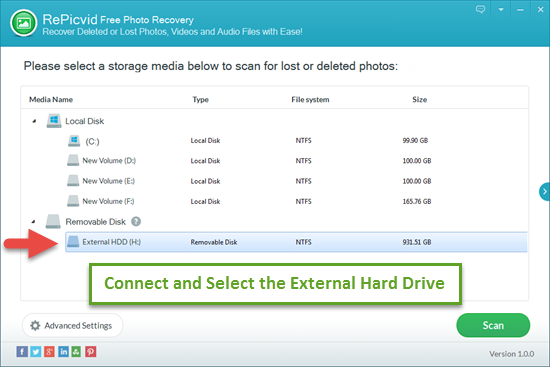 Select those you need and click the “Recover” button to save them onto another storage location. Finally, open the folder to check the deleted photos.